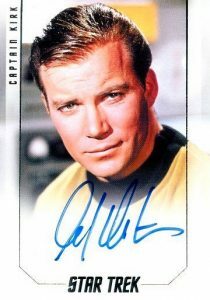 While The Original Series has already been the subject of a 50th anniversary set, 2017 Rittenhouse Star Trek 50th Anniversary takes a broader approach with both the television and movie entities during the five decades. Hobby boxes promise two signed cards and a relic book card. 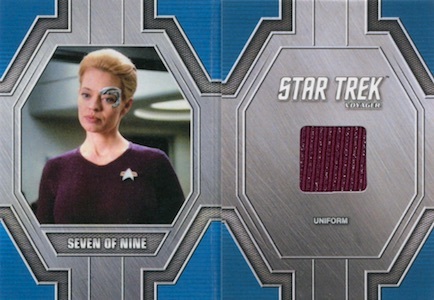 Documenting the key moments in Star Trek history for both tv and film, the 100-card base set includes a foil-etched design. 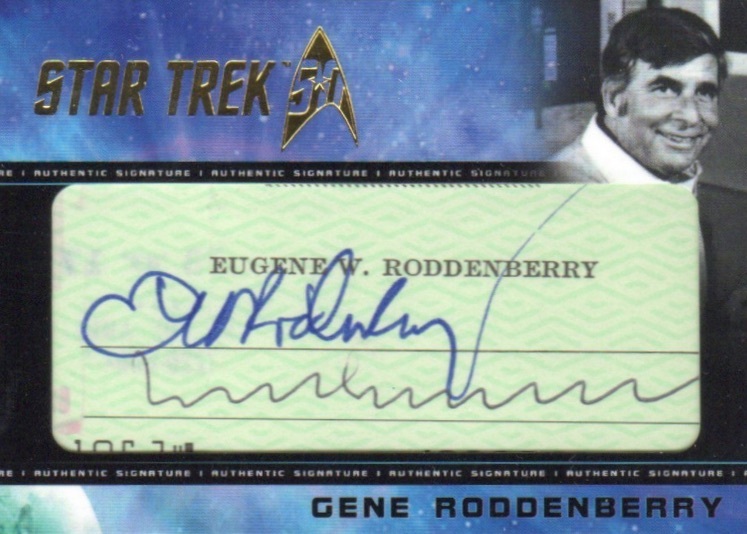 Falling two per box, collectors can find a varied timeframe of Star Trek Autographs in 2017 Rittenhouse Star Trek 50th Anniversary, including all captains from multiple points in the television franchise at one per case. 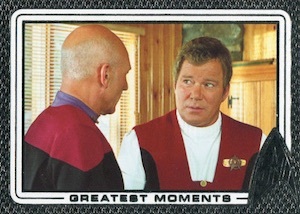 This group of captains is led by Patrick Stewart as Jean-Luc Picard from The Next Generation and William Shatner as James T. Kirk from The Original Series. Mixing in another hit choice, every box yields a Relic Booklet of which there are over 50 different versions to collect. 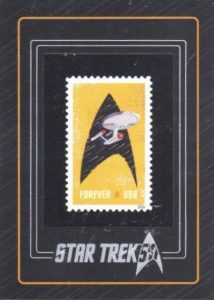 2017 Rittenhouse Star Trek 50th Anniversary also features quite a few Star Trek inserts. 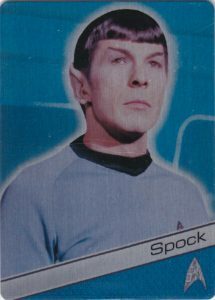 Heroes (1:24 packs) is a metal-based set that offers 50 of the biggest names for Trekkies. Artist Emily Tester adds her own touch with Artifex portraits (1:12 packs). This 50-card set also contains commissioned Originals (1/1). 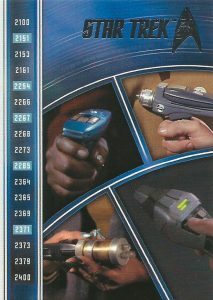 More narrow insert coverage is found with choices such as Evolution (1:96 packs), which looks to the history of phasers and tricoders in a nine-card set. 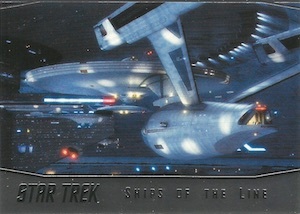 Ships of the Line (1:96 packs) highlights the notable renditions of the U.S.S. 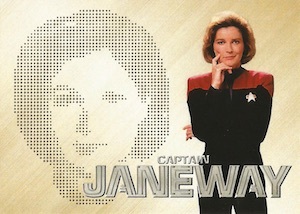 Enterprise with nine cards. 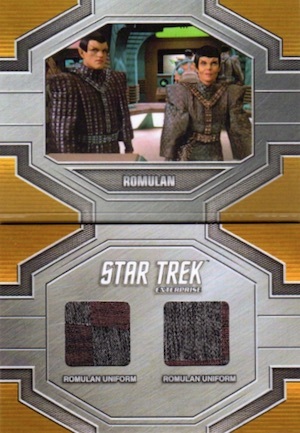 Focusing on main characters, Starfleet Captains (1:48 packs - 18 cards) touches on both the big and small screen while Phaser Cut (1:288 packs - 10 cards) sticks solely with the tv shows on a new, high-tech design. 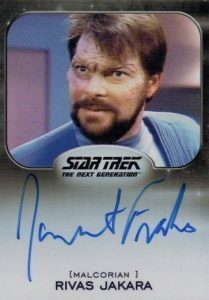 There are also limited Sketch cards in 2017 Rittenhouse Star Trek 50th Anniversary. In addition, a custom album is sold separately and includes promo cards. 6-Case: U.S.S. 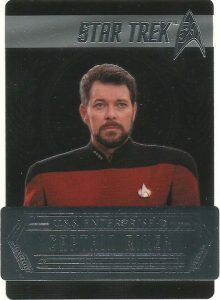 Enterprise Hull Relic Card. 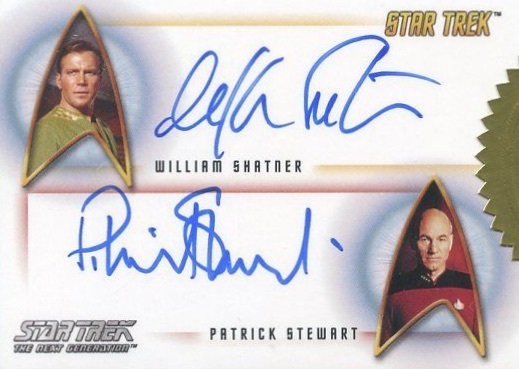 9-Case: William Shatner (Captain Kirk) and Patrick Stewart (Captain Picard) Dual Autograph. 18-Case: Archives Box with the four printing plates for a base card from the set. 74 In a Mirror, Darkly: Part 2"
1 card. Not in packs. Star Trek Women Of 50th Anniversary Autograph Card Teri Garr Archive Box Excl.